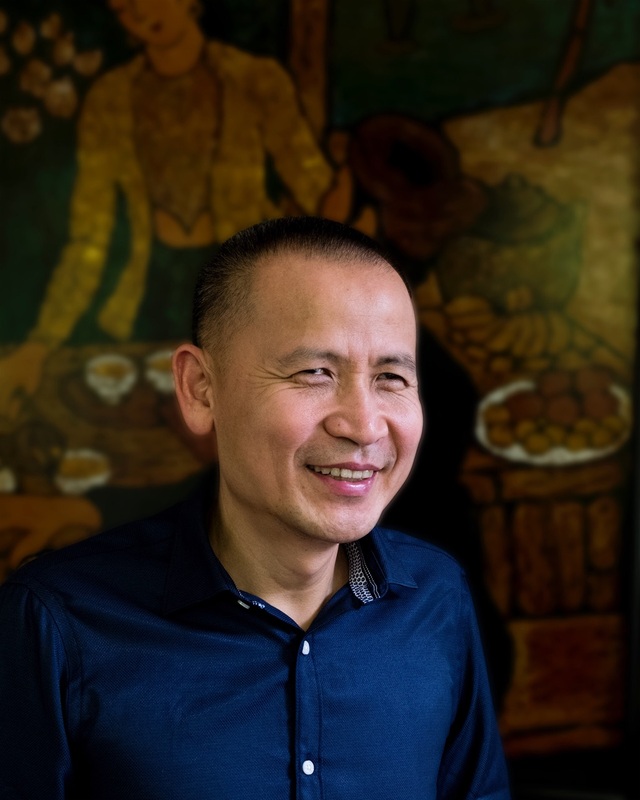 Join John Tue Nguyen on a celebratory tour through his home country of Vietnam and neighboring Cambodia. Experience authentic and deeply enriching bespoke activities in a truly exclusive program. Despite increasing development, Vietnam’s capital Hanoi is an ancient city with strong cultural traditions – one of Asia’s loveliest cities. We take a ‘Day in the life of a Hanoian’ guided tour, which reveals Hanoi’s hidden charms and local soul. Café culture is an important element of Hanoi daily life. We stop at a typical street side coffee shop in the Old Quarter to sip robust, home-grown coffee beans. Head to Gioi Market, a 1950s flea market, where countless stalls ply a diverse range of household goods. After a short ride on a local train, alight and walk across Long Bien Bridge, a famous cantilever bridge spanning the Red River, constructed during the French Indochina-era. Following our guide and the train tracks, we walk deep into a local neighbourhood for a fascinating insight into daily life played out beside the railway line. Enjoy a private dinner at the National Museum of Vietnamese History in the illuminated courtyard, hosted by an esteemed history expert. Drive southeast from Hanoi and board the Ginger Cruise Ship, your luxurious ‘floating home’ resembling a traditional-style junk boat. The Ginger first cruises through Halong Bay (‘Descending Dragon’), one of Asia’s most magnificent natural splendours and a UNESCO World Heritage Site. Here, a spectacular seascape of over 1,600 limestone islands and islets jut out of emerald green waters. Amongst other wonders, we sail past Da Chong Islet and a century-old lighthouse built by the French colonials. Continue on to Lan Ha Bay, equally stunning, but relatively less crowded and more tranquil, only recently opened to tourist boats. Disembark at Ba Trai Dao, one of many beautiful mythical spots, where we can swim and kayak in clear calm waters. Later, join the Ginger crew for some nighttime squid fishing! 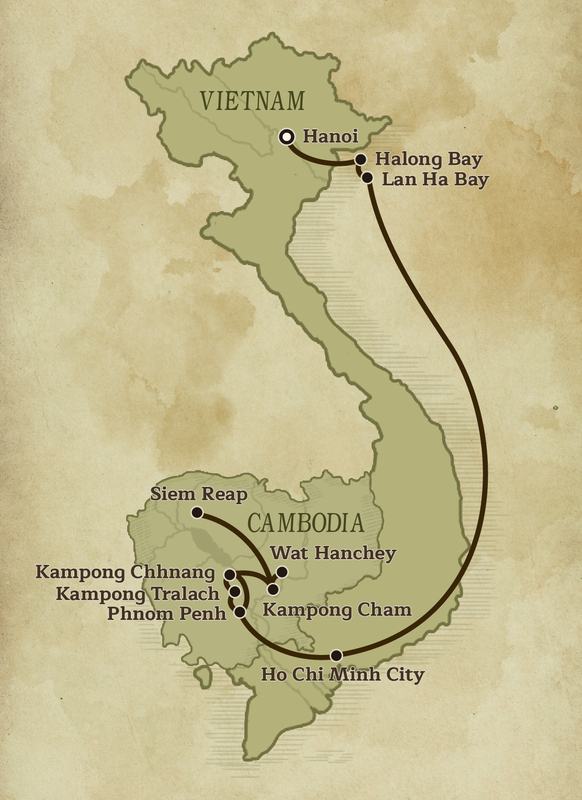 The Ginger sails on to two separate villages, Tai Keo and Viet Hai, where we disembark and engage with local villagers, connecting with typical island life in the bay. We tour Viet Hai Village by bicycle. Halong and Lan Ha bays are home to countless ethereal limestone caves and grottoes. Explore Toi Sang (‘Dark and Bright’) Cave, one of Lan Ha Bay’s must-see cave complex for the adventurous! Toi Sang is a beautiful grotto split in two parts, boasting rich biodiversity and crystal clear water. Once through the mouth of ‘Dark Cave’ by kayak or rowboat, enter a tranquil sea-lake sheathed in fig trees and orchids. Aptly-named Dark Cave is immersed in low natural light. Paddle through for 100m (328ft) for daylight and the shorter, more open, ‘Bright Cave’. 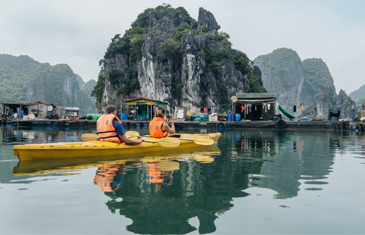 Explore Frog Pool by sampan, another stunning rocky islet within Halong Bay. Bid farewell to the Ginger and return to Hanoi. 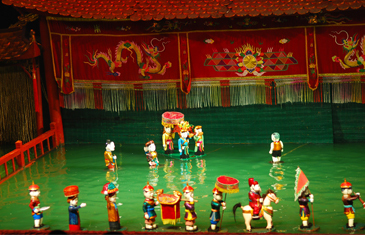 Water puppetry is a unique folk art originating in northern Vietnam’s Red River Delta, practiced by rice farmers in flooded paddies for centuries. Wooden puppets seemingly floating on water play out original stories based on folk tales. This cultural tradition nearly died out, but in recent times has enjoyed a revival. Beyond Hanoi, visit Dao Thuc Village, where water puppetry has been practiced for three centuries. At a puppet making workshop, meet a master puppeteer and learn about the history of puppetry. Enjoy a private water puppet show on the village pond, accompanied by traditional music. See how the puppeteers stand chest-deep in water, manipulating the puppets by underwater bamboo sticks. Although Ho Chi Minh City is Vietnam’s largest, most modern city, remnants of the former Saigon and its storied past are omnipresent. Meet an esteemed cultural and history researcher for a historical overview and bespoke city tour revealing key landmarks and architectural masterpieces. The Jade Pagoda, Archbishop’s Palace and Fine Arts Museum are magnificent highlights. Later, visit a former US Ambassador’s residence, a historic 1960s villa restored to its former glory and fitting setting to watch a short documentary on the Saigon-era. The day concludes at Saigon Salon, a modern refined art space within a restored colonial villa, established to showcase Vietnamese contemporary art. Curator and Vietnamese-French artist Sandrine Llouquet gives a brief introduction to Vietnamese art history. Enjoy a cocktail reception and a special private arts performance. Meet local artists to discuss their art and join them for an exclusive dinner. Astride the confluence of the Tonlé and Mekong rivers, the Cambodian capital, Phnom Penh, is a rapidly developing city with a momentous past. 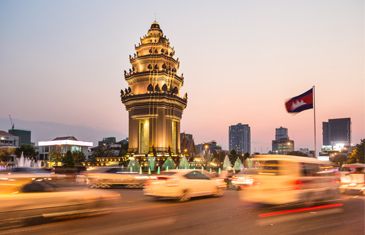 Once known as the ‘Paris of the East’ of former Indochina, Phnom Penh still boasts an enthralling blend of Khmer and French colonial architecture and rustic charm. Day two, embark on our luxurious cruise ship, The Jahan, designed to evoke the opulent British Colonial India-era. We tour the sobering Tuol Sleng Genocide Museum, housing ‘Prison S21,’ the most notorious of numerous detention centres established by the brutal Khmer Rouge regime. Countless Cambodians were summarily executed at Choeung Ek, or ‘The Killing Fields,’ located outside Phnom Penh. Both sites present haunting testament to the 1970s Khmer mass genocides. Visits to cultural heritage gems include the Royal Palace and National Museum. 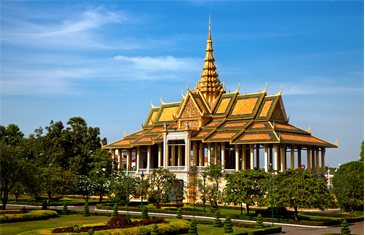 Later onboard, enjoy a lecture on Cambodia’s modern-era history and BBQ dinner with a traditional Khmer dance performance. Before sunrise, The Jahan sets sail along the meandering Tonlé River, bound for Kampong Tralach. Cruise past hamlets overhung with lush foliage, waved at by excited local children taking their livestock down to the river for an early morning bathe. We arrive at Kampong Chhnang, Cambodia’s amazing ‘water world’ of wetlands and floating villages. Transported through verdant rice paddies and peaceful bucolic countryside, we stop at Aundaung Russey Village, where traditional Khmer pottery is still hand-produced. Delve deep into the wetlands, exploring waterways that reveal rustic stilt-houses and fish farms typical of the region. The Jahan will moor overnight near Phnom Penh. Departing from Phnom Penh before dawn breaks, The Jahan sails to a little-visited and quaint silk weaving village. Here, observe local women still weaving silk the traditional way on manual looms. Cruising the lower Mekong River, get an up-close look at typical riverside communities, daily local life and sun-hardened fishermen casting nets from fishing boats. Disembark at Angkor Ban; a century-old rural village where time seems to stand still and age-old traditions are maintained. Note the simple wooden dwellings constructed by hand. Welcomed with genuine warmth by the villagers, experience village life first hand, even participating in some daily activities. 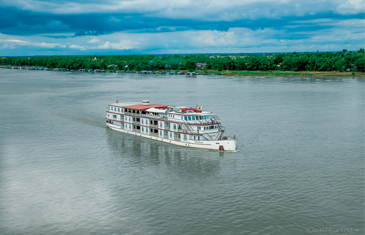 The Jahan cruises on to Kampong Cham. Make an early morning foray to pre-Angkorian temple, Wat Hanchey. Located atop a hill beside the river, this 8th century Buddhist temple reveals spectacular Mekong River views. Wat Hanchey is also a fine example of the superb architecture typical of the Chenla Empire and was an important centre of worship during this era. A highlight is the remarkable brick sanctuary with well-preserved ancient Sanskrit inscriptions. While here, we have an opportunity to engage with resident Buddhist monks. Back onboard The Jahan, witness a blessing ceremony performed by local orange-clad monks. We sail back towards Kampong Cham for Wat Nokor, a Wat built within the ruins of an ancient temple. With few visitors here, enjoy the deserted ambiance. We arrive in northwest Cambodia and Siem Reap, gateway to the Angkor Archaeological Park, a UNESCO World Heritage Site containing the stupendous remains of an ancient Khmer civilization. There is, however, more to this charming provincial town; this afternoon we get acquainted with some of its alternative distractions. Artisans d’Angkor, a socially-committed Cambodian outfit, is well-known for successfully reviving and showcasing traditional Khmer craftsmanship, including silk production. They also help provide long-term employment for rural artisans. At Wat Damnak, a royal palace during King Sisowath’s reign and an important city pagoda, receive a personal blessing from a Buddhist monk. A stop at both the city’s old and new markets, located on opposite sides of the river, is the perfect opportunity for purchasing artisan crafts. 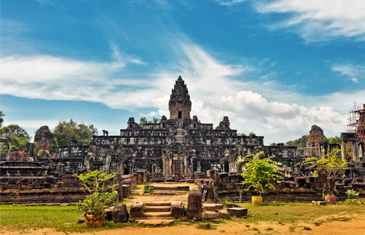 Explore some of the astounding temples within Angkor Archaeological Park. Ta Prohm, a 12th century Buddhist temple, is iconic for fig tree roots bursting through its massive stone blocks. Angkor Thom, an inner walled city that served as the Khmer Empire’s ancient royal capital, contains Bayon Temple, distinctive for its giant serene faces carved into stone towers. Continue to 12th century Angkor Wat temple complex, ranked as one of the world’s greatest ancient wonders and largest religious monument. Our private tour is hosted by a renowned Khmer scholar and Angkor Temple Conservationist. Later, in the grounds of 10th century Prasat Kravan temple, enjoy a memorable private dinner and farewell message from our esteemed host, John Tue Nguyen. A fitting end to an extraordinary celebratory tour across Vietnam and Cambodia! Transfer to Siem Reap for your onward flight.